Travelling is a liberating experience. This is one of the most effective ways of releasing the pent-up stress that occurs due to the daily work pressure both at home and at office. However travelling is a hobby that comes with a certain amount o expense. Hence it is wise to plan the budget of your travel plan well ahead. This is one of the ways of making your tour plan both well planned and kept within your means. The sample travel budget templates can be relied upon for an effective format. You may also visit Trip Planner Templates. What does a Travel Budget Plan usually consist of? A travel budget plan is designed based on the trip and the traveller’s necessity. Before you download one of the sample travel budget templates that we have got for free, you should know what a plan such as that is usually made up of. 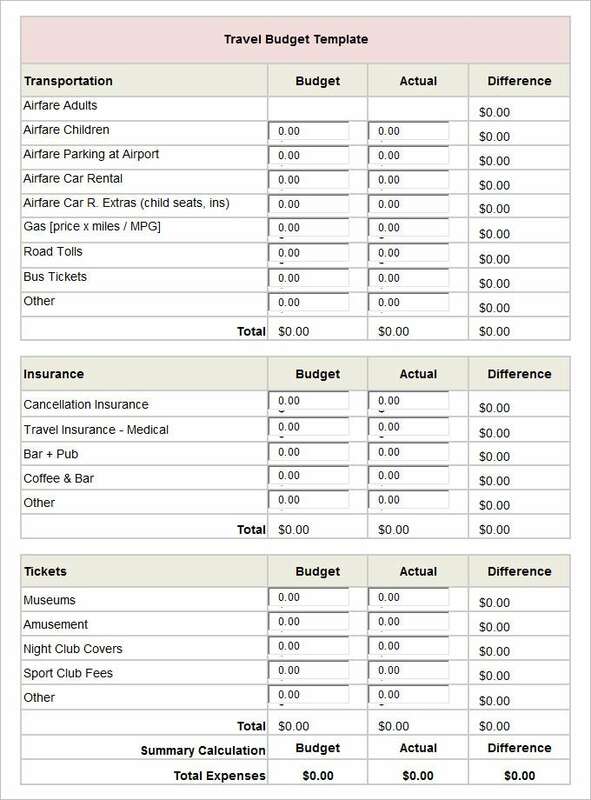 Here are all the components of a travel budget template listed out. All the areas of the trip or the travel that need spending on. A plan that is made so that the trip takes place within a given budget. This is one of the template designs that can be trusted upon for creating one of the most effective travel budget plans. The template has a table format that gives a very neat look to the entire document. The various columns support information of the cost incurred on food, lodging, traveling, shopping etc. 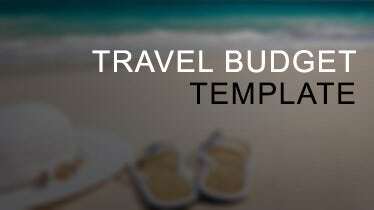 This sample travel budget template can be downloaded so that a travel budget can be planned out for business purpose. 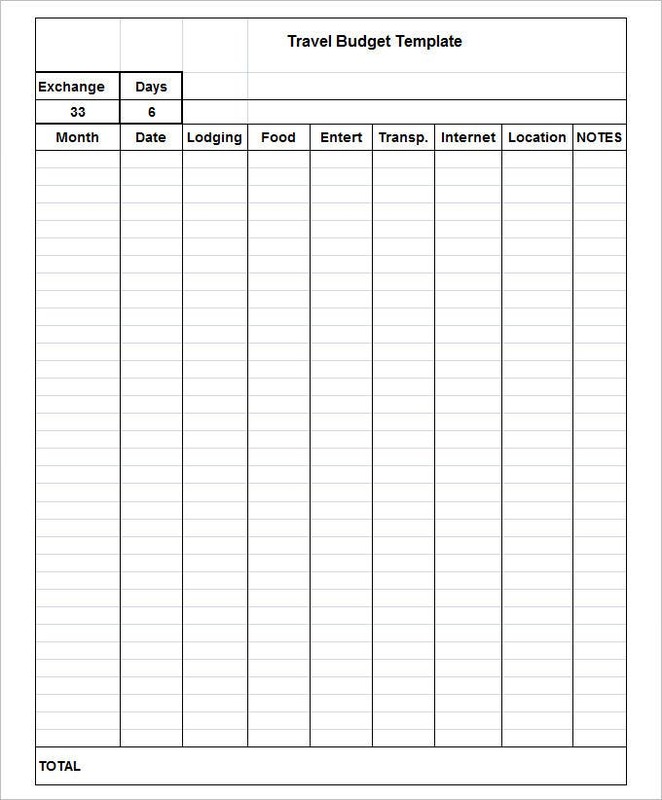 This is a template that will contain all the respective information pertaining to a travel pan. The resolution of the template is a very good one that will provide good quality of printouts. This is a sample travel budget template that can be downloaded with ease. It is available over the internet. The designs are professionally made and can be used by the person to make an effective travel budget schema. The template has hundred percent responsive features that will allow a person to navigate easily through the template. What Is A Sample Travel Budget Template? This is a professionally made format that can be employed for the purpose of making a rough estimate of the amount of expenditure that is going to be involved in the process travelling. 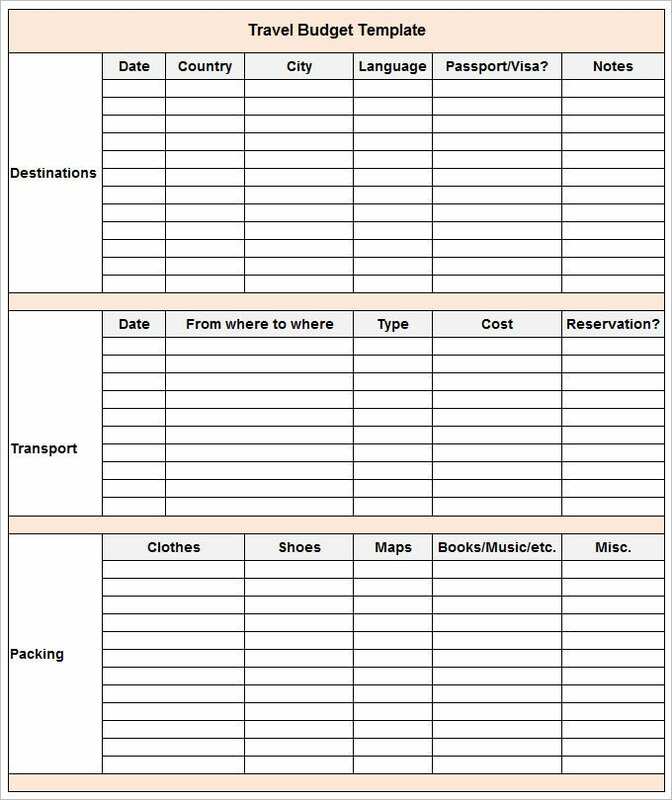 This is a format that can really help you to plan your budget at the time of travelling. This can help you to keep your budget well in your means. This is a template format that can be well suited for a vast number of people. This can be downloaded for both personal as well as for professional purpose. These templates can be well employed by the traveling companies who make elaborate travel and tour plans with a wide number of people. The biggest benefit of this type of templates is that they provide professionally made formats. The user can start straight away with feeding in information and can start his plan. The sample travel budget templates can be best relied upon to be to create the most effective tour plan and budget estimate. They can help to make your tor plans better organized and disciplined. If you have any DMCA issues on this post, please contact us!